1st September 2017 - this significant view of time and space from the A4 at Rudloe Firs, across Hudswell, the Jurassic Clay Vale, the Cretaceous lower and upper greensand and the lower, middle and upper chalk of Bowden Hill, Bromham and the Marlborough Downs will be blighted, contrary to local plans (the Core Strategy etc), by Redcliffe's 170-home, speculative development which starts on Monday 4th September 2017. And what would the local guardians of our precious landscapes have to say ... well, it was a former (and perhaps current) member of Corsham Civic Society who sold the land to Redcliffe. Everything has its price. 10th August 2017 - in spite of an extant consultation and decision making process through planning application 17/06091/VAR, Redcliffe plans to start building its speculative, 170-home estate on the 'strategic gap' (see photo below) between Corsham and Rudloe on 4th September 2017. The 'strategic gap' phrase comes from the local (Corsham Town Council and others) decision that such gaps should be maintained between Corsham and outlying settlements such as Rudloe and Neston in order that Corsham did not become a vast dormitory conurbation. So much for the power of local decision-making set out under the (dare I say it) grand Tory plan to put such decision-making in the hands of local people! The first page of my 9-page representation on planning application 17/06091/VAR is shown below. The full document can be viewed through the file icon shown below the first page. 9th March 2017 - Wiltshire Council will decide tomorrow, 10th March 2017, whether the trees shown in the following photographs, taken today 9th March 2017, may be removed according to Redcliffe's Tree Removal Plan dated 6th February 2017. The consultation request email sent by Wiltshire Council on 8th February said: "Please find attached letter in reference to the above planning application and following the receipt of amended and additional plans and documentation. We would be grateful if any additional comments you may have can be sent to the Planning Department by 01/03/2017." The trees were removed on 14th February - the St Valentine's Day Massacre. This state of affairs is discussed in Paul Kingsnorth's book Real England with "... a big infrastructure project or new housing development to push through will involve deciding what will be done, consulting local people and others, and doing it anyway". Note that whilst all these views are taken from Park Lane, all previous articles on this Redcliffe development site may be found under 'Bradford Road' so for consistency that's where this article and the last one also sit. Further views, which will soon be lost, across this development field may be found under 'Localities', 'Hudswell'. The (blurred) picture catches a tree falling on 14th February at the south-east corner of the site of Redcliffe's speculative planning application 16/09292/REM. The Tree Removal Plan, dated 6th February 2017, may be found on the Wiltshire Council webpage for 16/09292/REM. The Consultation Expiry date is 1st March 2017 - this is the date by which any representations on Redcliffe's plans should be registered. Yet here we find, two weeks before the consultation period ends, Redcliffe riding roughshod over the planning process by removing not only the whole copse at the south-east corner of the site and but also a number of mature trees along Park Lane. So what powerful local person or institution is able to put a stop to developers riding roughshod over the planning system? Answers on a postcard please to ... no, don't bother, I'll tell you ... no one. Local people and institutions have less power now than in 2009. The people or institutions with power remain ... central government, the banks, the landowners, the developers, the builders. Even when the powerful Planning Inspectorate called a halt to this development requiring a report on the in-combination effects of all west Corsham developments on the Bradford-on-Avon and Bath Special Area of Conservation, the developer used a routine workaround - simply to submit a new planning application. 8th November 2016 - Redcliffe's planning application 16/09292/REM for its Bradford Road speculation has crept under the rudloescene radar - family, friends, life and death have intervened. The photograph above was taken in May just after harvesting. Redcliffe's documents misidentified the crop as "maze" - and they couldn't even spell that correctly! The photo shows the scene in the Methuen Arms after the marathon three-and-a-half hour meeting of the Northern Area Planning Committee on Wednesday 17th February. The candle, along with west Corsham's farmland is just about expired. Planners and planning committees are, thanks to Government policy and the National Planning Policy Framework, having to condemn hundreds of hectares of local, productive farmland to tarmac and reconstituted block. We are rushing headlong into an abyss. This was trumpeted, at the outset of the last government, as localism. The crux of the matter of this particular application became bats. The Planning Inspector, in denying Redcliffe's appeal on the previous application stated: " ...reflecting the conclusions of the Wadenzee case, Regulation 61 requires that an appropriate assessment would not only need to take into account the effect of the proposed scheme on the appeal site, but also the possible effect together with (ie in combination with) any other proposed or committed development in the vicinity would have to be considered". The three speakers against this proposal; David Taylor, Tony Clark and myself understood this and focussed our three 'speeches' on this and the fact that in spite of the Planning Inspector’s ruling, no attempt whatsoever had been made to correlate one planning application with another and no report had been produced on in-combination effects. The three speeches (file 'links' below) and the planning inspector's in-combination effects were completely ignored by the committee. Also below are two post-meeting emails from yours truly, one sent to Wiltshire Council, copy to our local MPs and the Planning Inspectorate and the other to CPRE. A third email from the Pickwick Association to Corsham Town Council reports: the supportive involvement of local MP Michelle Donelan; a constructive meeting with Ms Donelan and Natural England, and a proposal to seek legal advice. However, it seems that the decision is, effectively, already made! A report dated 12th February in the publication Insider Media states: "The resubmitted plans are recommended for approval by a report to be considered at a meeting of Wiltshire Council's Northern Area planning committee on Wednesday (17 February 2016)". The Northern Area Planning Committee meeting will take place at the Council offices, Monkton Park, Chippenham next Wednesday, 17th February at 3pm. I propose to speak against the proposal; if anyone out there would like to join me would they please get in touch by means of the 'Contact' page on this website or phone: 07803 295291. Pending a final decision by the Secretary of State, planning application 15/00712/WCM from Hanson for a new mine entrance (to Hartham Quarry) in Bradford Road was approved by Wiltshire's Strategic Planning Committee on 9th December with eight members voting for and three against. Three members of the public, including a former mine manager with 46 years' experience, spoke against the application to no avail. If Redcliffe's application for 170 homes and other unnecessary structures is also approved (application 15/10519/OUT) then this rural section of Bradford Road will be urbanised and industrialised. This state of affairs will be contrary to local plans and the wider county strategy. 6th December 2015 - Strategic Planning Committee meeting on Wednesday 9th December to decide, inter alia, on plannng application 15/00712/WCM - mine entrance, associated buildings and yard in Bradford Road. Up to six members of the public are allowed to speak on each agenda item, three in favour and three against. I would like to attend to put in my fivepennyworth but cannot owing to another commitment. And most importantly, representations (comments) should be made by Thursday 26th November 2015. This resubmission attempts to address some of the reasons given for the dismissal (by the Planning Inspectorate) of Redcliffe's appeal on 14/04179/OUT. However, the principal reason for the appeal dismissal, which Redcliffe has not and could not address, is that the Planning Inspector ruled that the 'in-combination effects' (on the activity of bats from the Bath and Bradford-on-Avon Special Area of Conservation site at Box mine) of all west Corsham planning applications, whether already approved or not, should be taken into account. For what it's worth, my 'representation' to Wiltshire planners can be found in the file below. Others may be found on the Wiltshire Council planning page for 15/10519/OUT using the 'button' below. Further representations from the public may be made via the online facility or directly to developmentmanagement@wiltshire.gov.uk. Such representations should be made by 27th August 2015. The inquiry by the Planning Inspectorate following Redcliffe's appeal against Wiltshire Council's refusal of planning application 14/04179/OUT took place at the Council offices, Chippenham today. The refusal and appeal centred on the bat situation, however other representations from locals Dean Musson, Clive Peaple and Paul Turner were allowed by the Planning Inspector, Geoffrey Hill. A 'new' interpretation of the Corsham Community Area housing requirement of 330 given in Strategic Housing Land Area Assessment and confirmed in the Core Strategy was introduced at today's meeting in that the 330 figure was a "minimum". This is the first I've heard of this - and it sounds like baloney - an equivocation in an attempt to justify the urbanisation of west Corsham. In spite of the Government's professed localism programme, all planning decisions are now, in the long run, in the hands of a single person, the Planning Inspector, whose decision is final. With the developers having the time, resources and finances, they are able to persist - and with the push, from the Government through its Department of Communities and Local Government and the NPPF, to develop at all costs, just about every application is now being allowed. Some policy of the advancement of brownfield over greenfield! Some localism! As the reader may gather, I don't hold out much hope of a refusal of the appeal by the Inspector. 7th July 2015 - the Planning Inspectorate hearing to determine Redcliffe's 14/04179/OUT planning appeal will be held at the Wiltshire Council offices at Monkton Park, Chippenham on Tuesday 28th July 2015 at 10am. Ref the email below from the Planning Officer, Mark Staincliffe, it looks like the hearing will be centred on the original reason for refusal (bats) and Redcliffe's appeal against same. This is (perhaps) unfortunate as Redcliffe argue a pretty good bat case. Part of their argument is that the Hannick development just up the road (and closer to the Box Mine SSSI) was approved with minimum research, survey evidence or documentation provided on bats, bat transects etc (I always believed that the Hannick development approval was pushed through, effectively, 'on the nod' with no objections from any 'official' body - Corsham Town Council, Box Parish Council, CPRE etc and no written evidence from the County Ecologist and no consultation at all with Natural England). Now the chickens are coming home to roost with regard to the Hannick approval - Councillor Whalley argued at the Northern Area Planning Committee that approval of the Hannick development would help the fight against further, speculative, greenfield developments. Well we can now see that the opposite is the case - Redcliffe is using this approval as an argument for its development. Given the above and the recent Gladman appeal success, I am losing hope that locals will have any weight with the Planning Inspector. It seems that west Corsham will be almost entirely given over to greenfield development with the Hannick, de Vernon (Potley) and Gladman proposals having received approval and Redcliffe about to be approved (I would stake my mortgage on it) and Putney (Sands Quarry, Westwells) waiting in the wings (the public consultation on this takes place at Neston Hall, tomorrow, Friday 17th July from 3-7pm prior to a third planning application for this greenfield (it is now!) site being submitted). And then we have the Rudloe No 2 and Copenacre brownfield sites which will be developed, without doubt, sooner or later. Redcliffe, in their original 'Accessibility and Facilities' document, compared "thriving" Corsham with "struggling" Melksham in an effort to justify Corsham development. Well, apart from my original contradiction of this ridiculous statement (Corsham has one small supermarket - the Co-op: Melksham has two superstores - Sainsbury's and Asda, three supermarkets - Waitrose, Lidl and Aldi, one 'farming' superstore - Countrywide and one department store - Leekes), subsequent events indicate that Corsham town centre is dying. Recent closures include NatWest bank, Higos insurance broker (leaving Calne and Devizes as their two Wiltshire branches), the Design and Craft shop (approval given for conversion to dwelling), Cinnamon restaurant, Madison ladies fashion and Wiltshire College Corsham Enterprise Centre (little enterprise shown here by the college authorities). Upcoming closures include Autobits, Loaf (the 'artisan' bread/cake shop) and HSBC bank (this closure will leave just one bank in Corsham). Corsham housing developments will be satellites for the better shopping/banking/education facilities of other local towns: Bath (of course), Chippenham, Melksham and Trowbridge - bringing a consequent, unnecessary increase in traffic volumes. I/we will have to think carefully about our representations to the hearing. Thank you for including me in the circulation of your email. For information I would have spoken against the Redcliffe Homes development at the Northern Area Planning Committee, and so would Corsham TC, but we were told we could not even debate this application. It was a straightforward refusal because the County Ecologist, who has statutory responsibilities, would not support it. One of the reasons for our opposition was a belief in the concept of a green buffer zone in between Corsham and Rudloe. I also spoke at the Gladman’s Appeal and whilst the Inspector accepted my arguments that Corsham had better sites, either brownfield or on poorer farmland, and that Corsham was delivering the housing needed to meet its targets, he found that the 5 year land supply for the whole of north Wiltshire was insufficient to meet targets and so granted approval. In short it was failings elsewhere that did for us not what was happening in Corsham. At Full Council last week we repaired some of the damage by approving the development plans for Chippenham but for us it is perhaps too little too late. Finally I still believe that we got it right on the Hannick Homes decision and that given what has happened recently a refusal would have been impossible to defend. I also stand by my argument that it strengthened our ability to defend against less suitable sites.. but that doesn’t mean we will always win the argument especially at the moment when the presumption of approval means the cards are stacked heavily in the hands of developers. And of course you argue with the benefit of hindsight. When the decision was made none of us knew that Gladman’s would win or that the County Ecologist’s refusal on the Redcliffe Homes application would come under serious challenge. Given recent events I do however share your pessimism about the Redcliffe Homes Appeal although I wouldn’t claim sufficient omnipotence to place my mortgage on it. Wiltshire Council has identified deficiencies in the bat survey information provided with planning application 15/00712/WCM. It was identified that the site of the proposal for a new mine access may have an impact on commuting and foraging routes of bat populations with the SAC (Special Areas of Conservation) site at Box. As a result, significant further survey work will have to be undertaken, the scope of which may not become apparent until the first survey has been started. This new survey will, in all likelihood, not take place until early autumn so the application is unlikely to be determined in the near future. When the applicant (Hanson) provides the required information, a further round of consultation will be necessary before the application can be presented to the Strategic Planning Committee. Note that the dates given in the 20th March article below have now changed. The appeal start date now is 16th April 2015 and representations (either new ones or additional to representations already made) should be received by the Planning Inspectorate by 21st May 2015. Representations may be made in writing or through an online form - see the file below for details. In addition, there will be a (one day) planning hearing which will probably take place at the Wiltshire Council offices, Monkton Park, Chippenham - date still to be announced. A notification of an appeal on planning application 14/04179/OUT was issued today by the Wiltshire Council Development Area Manager. The notification states "the appeal will be decided on the basis of written representations procedure" and goes on to say "If you wish you are now able to make written comments on the proposal. These should be sent in triplicate direct to the Planning Inspectorate, Room 3/10b Kite Wing, 2 The Square, Temple Quay House. Bristol BS1 6PN, quoting the Inspectorate reference, and should be received within 5 weeks of the start date above. Any representations received after the deadline will not normally be seen by the Inspector and will be returned". The appeal start date is 19th March 2015. The Notification also states "Any comments you may have already made following the original application will also be forwarded to the Inspectorate (unless they are expressly confidential) but you may withdraw, modify or amplify them now if you wish. All comments received will be copied to the appellant and will be taken into account by the Inspector in deciding the appeal". Please see the link to the Notification below for further information. However ... having said all that, Wiltshire Council proposes to "robustly defend" the refusal decision (hopefully through a public inquiry process!). When the Redcliffe application was refused, the Council did not have a five-year land supply and it was considered against the old Local Plan. Since that date Wilts Council has adopted the Wiltshire Core Strategy and there is now a five-year land supply (this was argued at the Gladman Appeal). The Gladman Appeal decision may (should!) clarify the Council’s position on the five-year land supply. A summary of the proposed development from the Wilts CC webpage follows: Construction of an inclined mine entrance from the surface into existing permitted mine workings construction of ancillary surface facilities including access onto highway offices car park workshop covered storage open storage landscaping and restoration. There are 26 plans and 31 statement documents associated with this application (so a lot of reading) - click on the 'button' below to be taken directly to the application on the Wilts CC website. From the local jungle telegraph, it seems the bottom line is that Hanson's lease on the existing adit at the Pickwick Quarry entrance will expire in February 2016. Note that the deadline for objections or comments is Friday 27th February 2015. 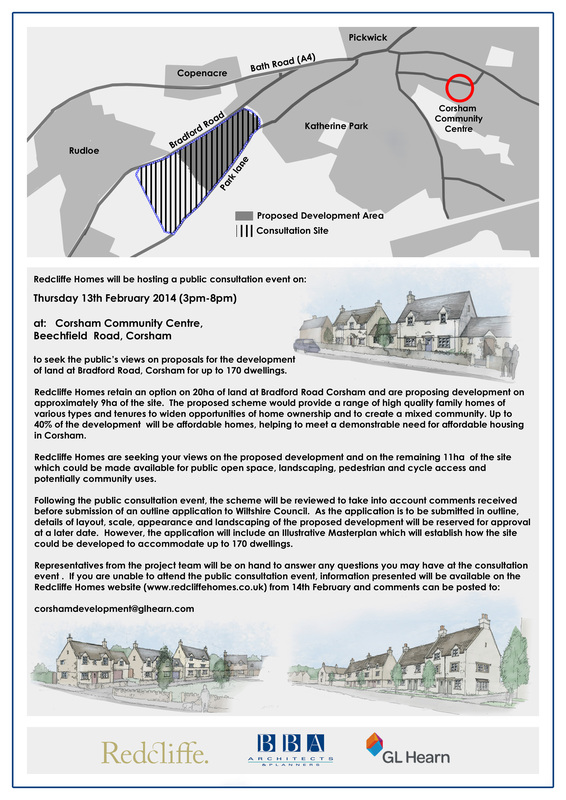 Corsham Town Council Planning Committee approved this application at its 18th February 2015 meeting. A member of the public spoke against the application with regard to building scale (he said that one of the buildings would be 100 metres long and 6 metres high at the eaves - the 6 metres is correct for one of the buildings but it's 5 metres for the other and both are 30 metres long) and lighting (he said that there was no mention of lighting in the plans). Three of the twelve (?) councillors present spoke briefly: one said that if a mine was approved here, housing applications would be obviated thus maintaining the gap (?) between Pickwick and Rudloe; another cited underground distances and 'health and safety'; another said that, as with Copenacre, the gateway to Corsham must not be blighted by unsightly buildings and if the buildings were of Bath Stone then that would be acceptable (the buildings proposed are industrial, cladded). No mention was made of the strategic gap (other than the committee member who said that this would maintain it!) nor of the industrialisation of a rural area nor of the application's contravention of 'Corsham Town Council's Strategic Plan 2014 - 2018' which states, amongst its objectives, "To preserve an undeveloped gap between Corsham and outlying settlements, and between smaller, individual settlements". No vote was taken, the chairwoman assumed the committee was all in favour and it went through on the nod - that's local democracy for you. And what is the point in spending an inordinate amout of time creating a strategic plan if its objectives are completely ignored by the very body that created it? Altogether, a superficial discussion and irrational decision by a committee groping around in the dark. At today's Northern Area Planning Committee in Chippenham, the subject planning application was refused unanimously on the grounds of 'bats'. This may mean that the three brilliant speeches delivered by Dean Musson, Steph Wood and yours truly (file 'links' below) in opposition to the application will have to be reprised at some future date, See Wilts CC's 'Additional Information' below, provided at today's meeting, regarding the bats. The Northern Area Planning Committee meeting to determine the speculative, Redcliffe planning application 14/04179/OUT - 170 homes etc on land south of Bradford Road between Pickwick and Rudloe will be held in the Council Chamber at The Council Offices, Monkton Park, Chippenham at 3 p.m.on Wednesday 29th October 2014. Wilts County Council's notice of the meeting is given at the first link below this article. Readers should appreciate that the Planning Officer is recommending approval of this development. His report to the Area Planning Committee may be found at the second file link below. Up to three members of the public may speak at the meeting against this development (and three for). Please contact rudloescene if you wish to speak. In the current environment, where it seems that there is an imperative to build almost anywhere at all costs, one wonders whether it is worthwhile mounting another campaign to try to stop this development. With 88 homes and commercial units already approved at Rudloe, the Rudloe 'renaissance' of 11 homes by Green Square, the 17 homes under construction at Spring Tinings, future homes at the police station and the old dairy - both in Priory Street, 150 homes and a commercial unit at Pickwick, 100+ homes and other development at Copenacre, 180 homes at the ex-RAF No 2 site in Westwells Road, Corsham will move from a "quiet, unspoilt market town" (from the Visit Wiltshire website) to a damned great conurbation.